A couple of home magazines featured some of our photographs this summer, so I thought I’d blog a little bit about them here today…before it’s time to break out the pumpkins- ha! 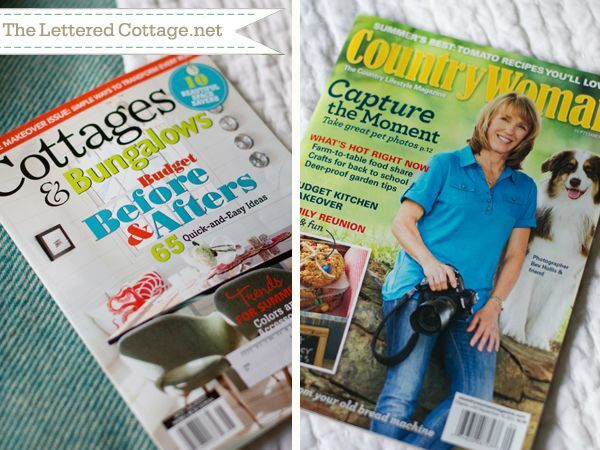 We shot Ashley and Jamin’s veranda for the June issue of Cottages & Bungalows, and the photos we took of our neighbors (Peter and Josette) kitchen were featured in the September issue of Country Woman magazine. 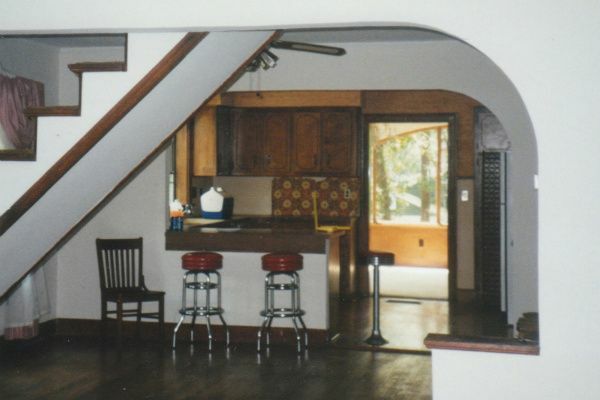 Among lots of other things, they removed the bar that separated the kitchen from the dining room, replaced all the light fixtures (with salvaged ones), and took down the 70’s-style linoleum backsplash. What a fantastic way to create shaker style cabinetry, huh? 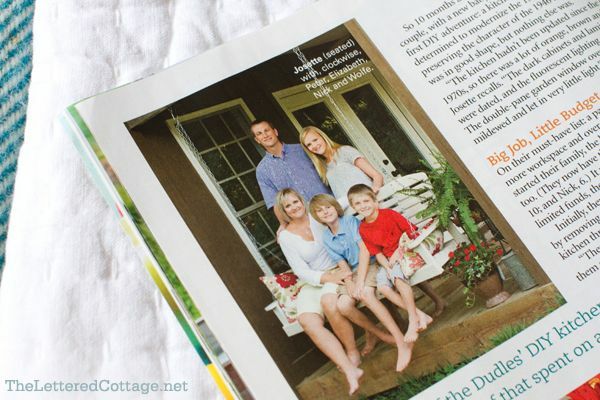 I got to take a photo of Peter and Josette’s family for the article, and it was so fun to read their story in the magazine! Our house is on the other side of the bushes just beyond their red kitchen door, and they have truly been the best neighbors a kooky couple could ask for! 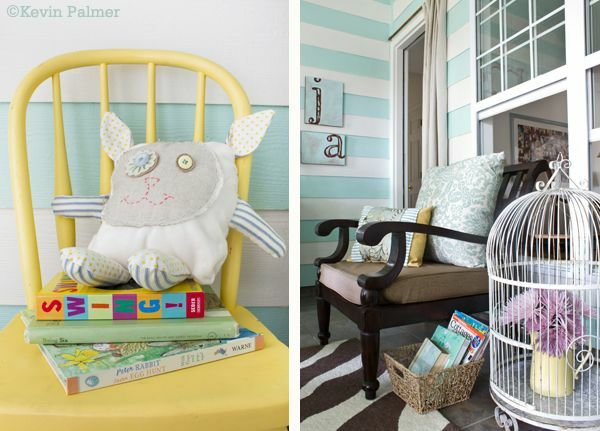 The pics we took of Ashley and Jamin’s porch were a ton of fun to style and shoot as well! We actually met Ashley and Jamin through their blog, and we were SO surprised to find out they lived in the next town over from us! Sometimes this bloggy world can be so small, can’t it? Speaking of room re-do’s- we hope to be finished with our (mini) master bathroom makeover sometime next week. It’s amazing what a can of paint, a few new goodies, and a little scrub-a-dub-dubbin’ will do, isn’t it? Thanks for sharing – both spaces look wonderful! 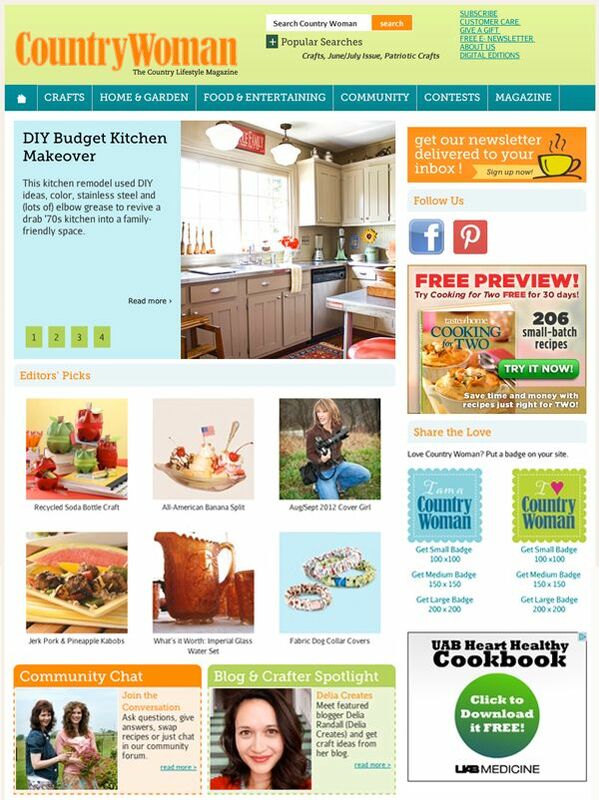 I’ve never heard of Country Woman magazine before – I will have to look out for it! Congratulations! Your photos and styling are just gorgeous. (One of these days I will be taking the photography class!) 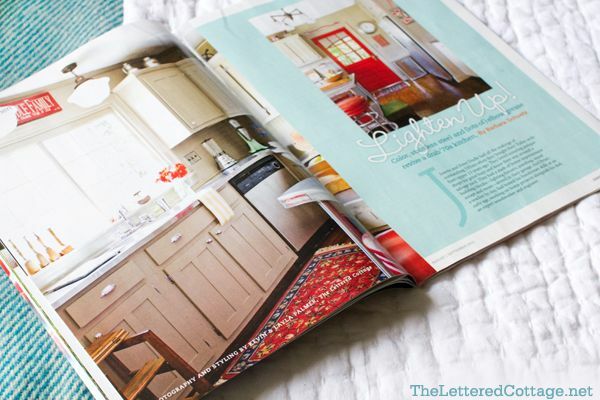 I love your neighbor’s kitchen… after I saw your e-zine originally I had shown it to my brother and sister-in-law who had cabinets very similar in their old farmhouse. 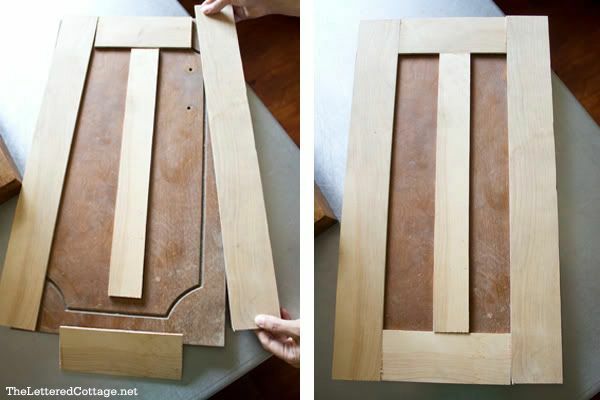 They used the inspiration to create their own shaker-style cabinetry and it looks amazing! It truly was an ingenious idea to use what you have and make it into something that looks custom and beautiful. Thanks for sharing and I hope you both have a wonderful weekend! 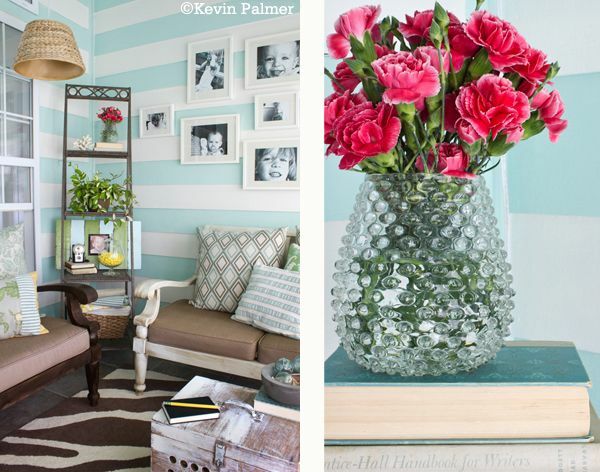 Is that vase a clear hobnail? I’ve never seen one like that before. Hey Mary! Yes, it is. We found it at a flea market! ;} It’s one of my faves! I love that vase! It just jumped out at me. What a great find. 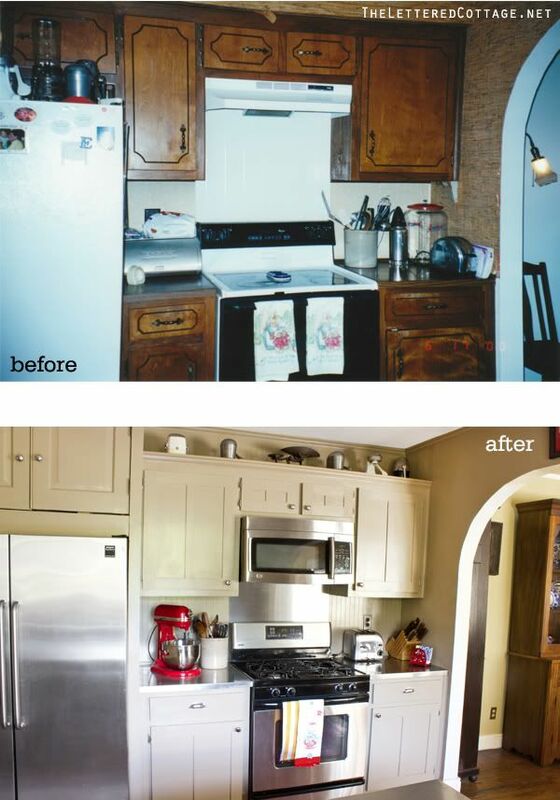 I’ve been racking my brain about how to “un-cathedral” my cabinets, and VOILA, your post! Thanks! Looks great (as always!) Can’t wait for the bath updates. Layla, the pictures are amazing! How fun! I’m off to check out and maybe subscribe to both of those mags (I’ve never heard of Country Woman). 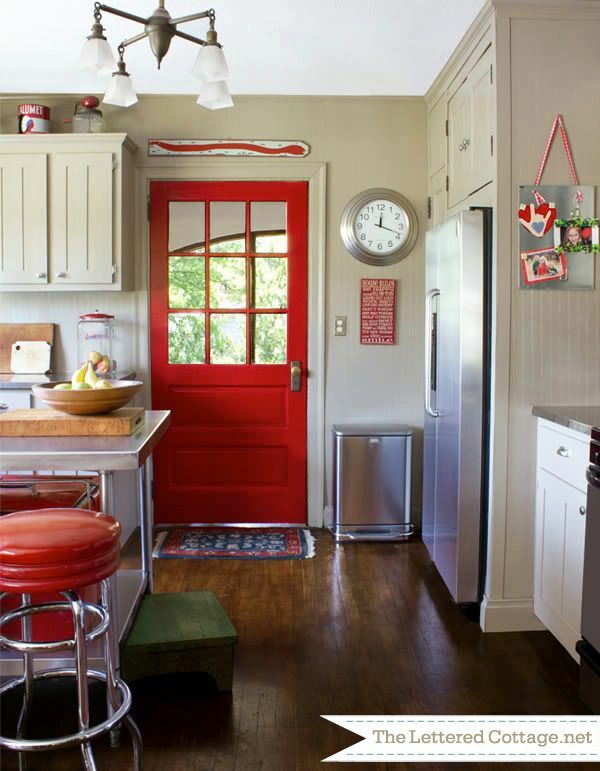 Oh, how I love that red door in the kitchen. we have ugly laminate cabinets….i’m going to reface them myself. i was afraid it was a wacky idea to do a wood veneer overlay, but glad to see an example of someone else doing this, too! 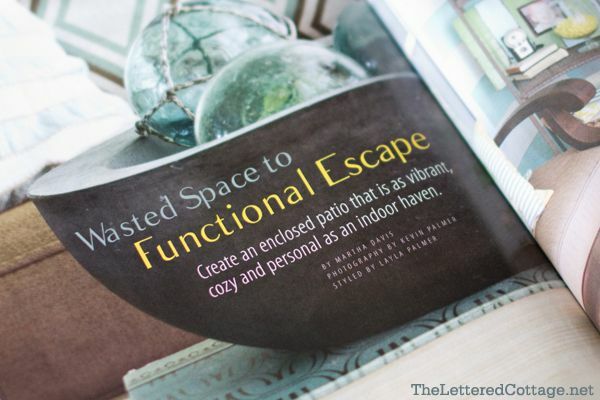 Wow there is so much inspiration in both magazine features. I love the pops of red in the kitchen and the cabinet make-over is genius!The porch is a dream with the expresso furniture and the blue and white walls.Congrats to all who worked together to make this happen! Yep, I’ve been in love with your neighbor’s kitchen for awhile now. I think it was one of the first things I pinned. Love the the color combination! I love your neighbors kitchen. I have seen it before and truly that is one of the smartest cabinet transformations I’ve ever seen. It is beautiful. Thanks for sharing. Love, love, love your blog. I wish it came directly to my email so I would not miss a post. I just left a comment on Miss Mustard Seed’s blog recommending Shoot, Fly, Shoot. It is a fabulous class….. I so need to go through it again! I kind of got caught up in other projects. The nice thing is, it is still right there, for me to retake at any given moment! Thanks for all the happy hours of visiting and entertainment. I love all of the work that you do! Keep it up sista! Their home is gorgeous, but it’s the inspired way they re-used their cabinet doors that gets the biggest thumbs up from me. Going to stash that idea away for later! Thank you for sharing this! I LOVE seeing such an amazing transformation! I love that red door! Love! 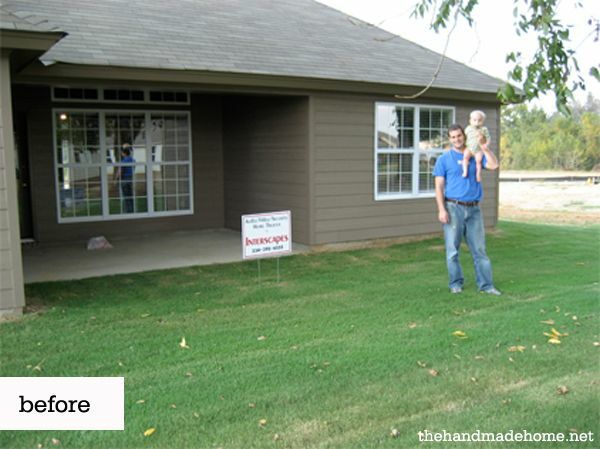 You and your hubby do SUCH GREAT WORK!! Always amazing! Congrats on all of the press! What a difference in the kitchen, really well done. I’m dying to know the paint name for that red door! It is FAB! Can you share it? Ralph Lauren’s California Poppy. Keep in mind though, the actual color may look a little different than in the picture. Wow…..what a transformation! Love the kitchen, paint color is phenomenal! You guys did a great job! I have to say I’m blown away with how clever that kitcchen re-do is. I would never have thought of putting the strips on the cupboard doors, but it totally makes the difference. In the kitchen picture showing the red door, I noticed a stainless steel table which is apparently an island/bar. Where was that purchased? thanks!